My visit to Managua, Nicaragua marked my 4th Central American capital city, having previously taken trips to Panama City, San Jose, Guatemala City and San Salvador. The later three had so much in common – grid-like streets leading to a historical district, neat plazas containing a cathedral, National Palace and large fountain, and a calm swirl of street vendors and locals milling about – and I had come to expect Managua to fall into a similar pattern. 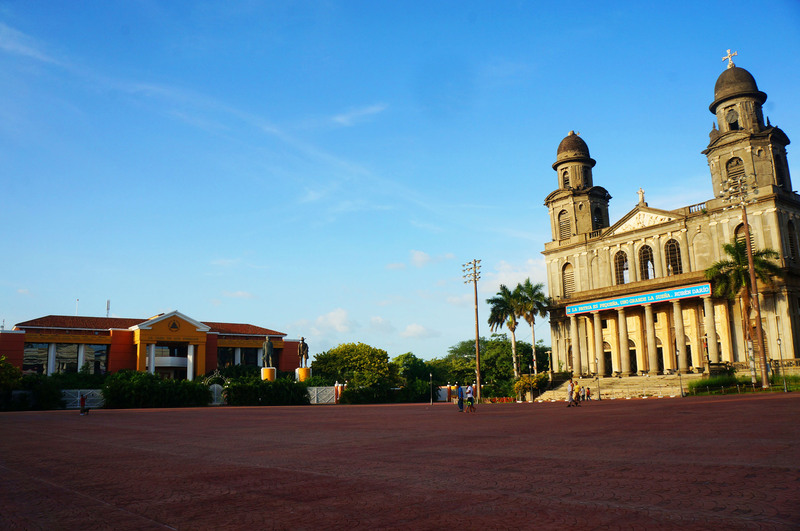 But Managua doesn’t stick to the usual blueprint of a Central American capital city. This is partially due to a 1972 earthquake that destroyed 90 percent of the city. Managua’s skyline today is low. Most buildings are no more than one story, and the city is composed of a hodgepodge of new, old and partially destroyed structures. The city’s kitschy feel is increased by the flamboyant, 90’s-era color pallet of neon yellow, pink, green and blue that has been used in many buildings, parks and statues. 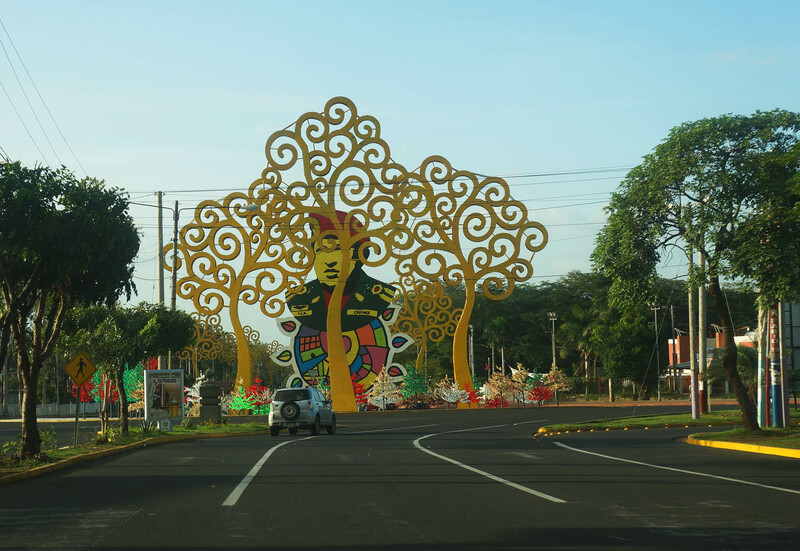 Managua is also scattered with oversized, seemingly random objects ranging from an airplane to metallic trees to miniature replicas of the city’s buildings, so that touring the city feels a bit like a scavenger hunt through your neighbor’s lawn – you know the one whose yard is home to gnomes, lawn deer and left-over Christmas decorations? During my visit, the Spanish soundtrack to Disney’s Frozen for some unknown reason blasted through the streets, pipped in through loudspeakers. My visit was also painted with another layer of Kafkaesque weirdness by my taxi driver/tour guide Roger pretending to be my boyfriend while we were walking around the sights. Roger was the first cab driver I encountered after reaching the Managua bus station. I needed to go to the airport but had time to spare. For an extra $5 he took me on a tour of the historical sights before dropping me off for my flight. I actually didn’t mind Roger’s little game of pretend because he didn’t actually give me any unwarranted physical contact, and his proximity warded off any cat calling. 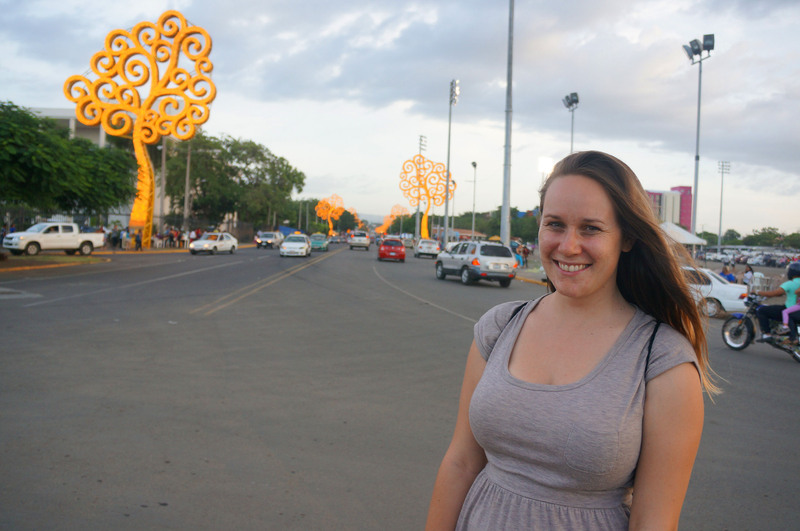 After two days of constant harassment in the streets of Granada I appreciated the opportunity to not stand out as much while walking around Managua, or at least not have people shout at me every two minutes. “No one will do anything to you here because I am with you and they respect me,” Roger said. Managua is strange. Although I was only in the city for a few hours as I stopped enroute to the airport, I still managed to see more strange things in Managua than anywhere else I’ve visited in Central America. Here’s the top eight unusual sights I discovered during my visit to Managua. A large, yellow bust of former Venezuelan President Hugo Chávez dominates a traffic circle in downtown Managua. It gets better. The bust of the late controversial figure sits atop a neon colored sun, surrounded by yellow metal trees. Driving by at night? No worries. The trees have light bulbs that illuminate Chávez’ face after dark so he can be seen at all hours of the day. You won’t find anything like this in the good old U.S. of A. 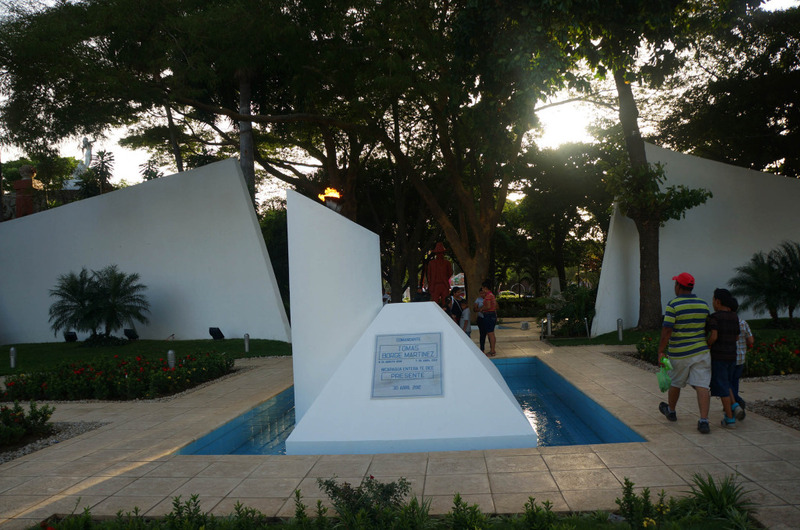 The memorial was dedicated in 2013 by Nicaragua’s First Lady Rosario Murillo following the dictator’s death from cancer. 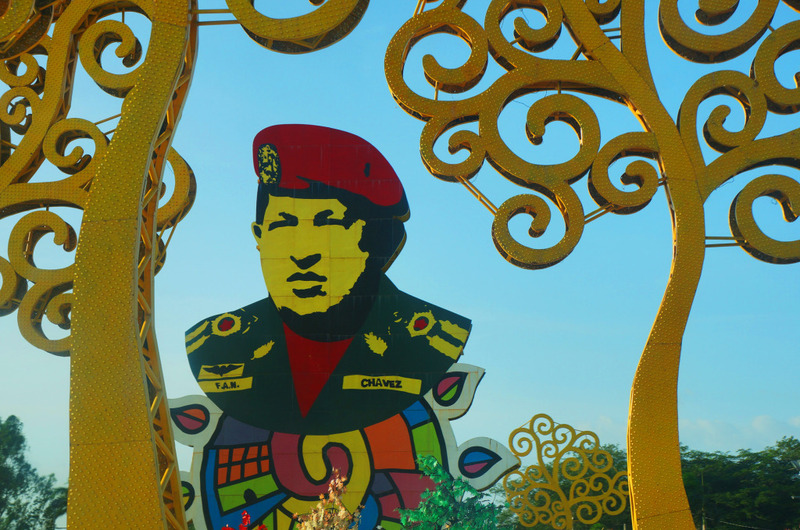 The traffic circle has been named the Hugo Chávez Eternal Commander Rotonda. Whereas in the United States, Chávez is considered a political enemy, in Nicaragua, at least according to the country’s President and First Lady, he is a hero. “He is a hero of Latin America that has helped the poorest countries … and his spirit lives on in our hearts,” the First Lady said at the traffic circle’s inauguration. 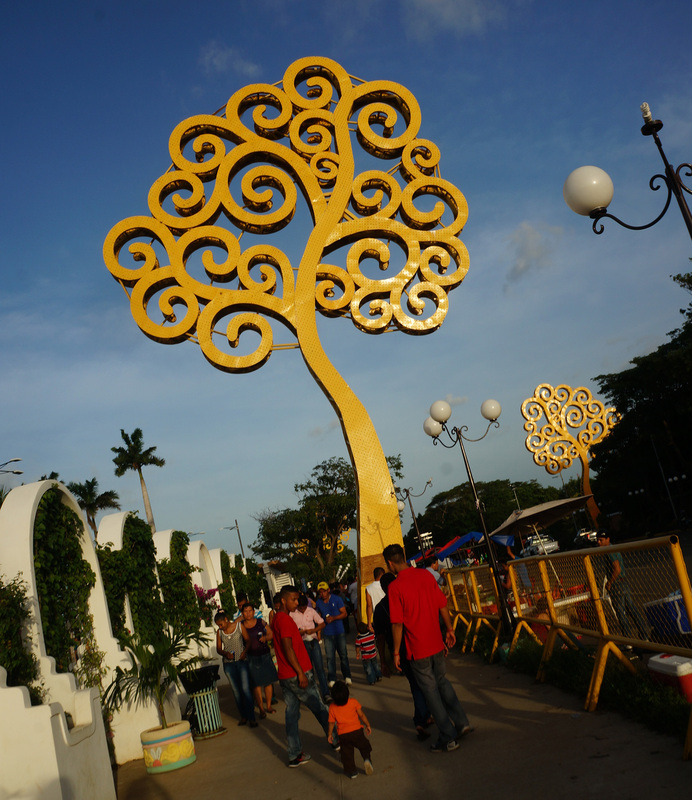 Chávez isn’t the only one honored by the presence of yellow metal trees in Managua. 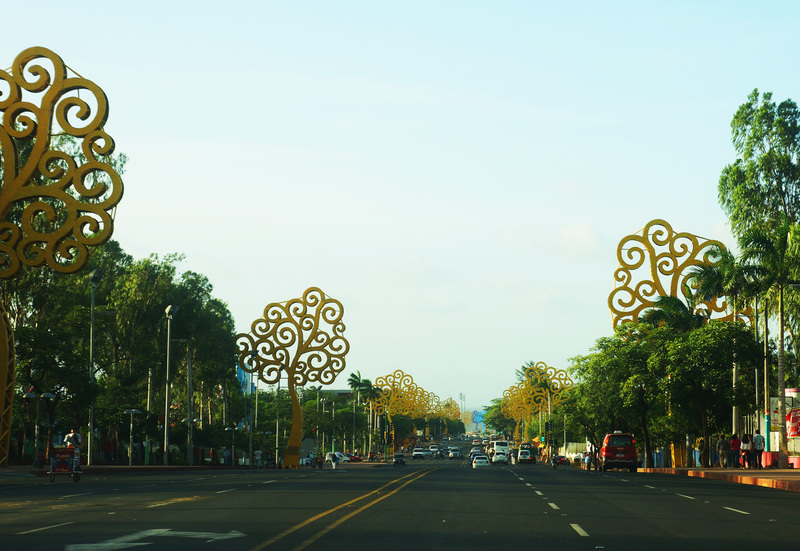 La Avenida Bolivar, the main road that passes through the center of Managua, is lined with dozens of looming, fanciful trees that look like they’ve leaped straight off the pages of a Dr. Seuss book. These 22 “trees of life,” designed by an Austrian architect, are covered with hundreds of lights that are lit during parts of the day and night. Each tree cost $20,000 USD to install and the group’s energy bill runs around $10,000 USD per month, a fact that has many Nicaraguans angry given the country’s bleak economic situation. Something about these trees felt a bit haunting for me, as if one day the post-apocalyptic world of Wall-E will come to fruition, and when we’ve exhausted all our natural resources, these metal trees will be all that’s left. 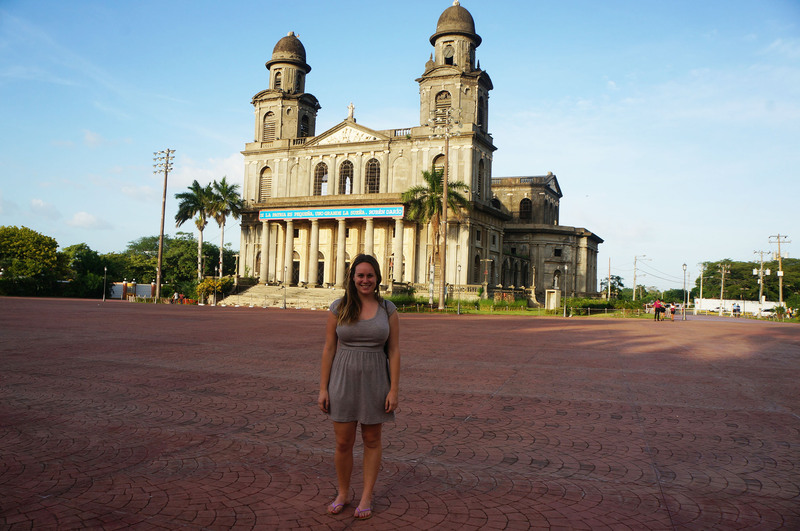 From the exterior, the Catedral de Santiago or Old Cathedral of Managua certainly doesn’t look like a strange sight. It has an impressive façade, complete with two bell towers, marble columns and statues. But look closer. All that remains of the cathedral following the 1972 is the façade. A new cathedral has been constructed for members of the Roman Catholic Church to attend mass. The story behind the cathedral also makes it a bit different. Unlike the majority of cathedrals that were constructed in the location where they stand, this cathedral was designed and built in Belgium in 1920 and then shipped overseas to Managua. 4. A Plaza for Revolution… and Romance? The Plaza de la Revolución is Managua’s main hub for culture. In addition to the Old Cathedral, it is also home to Central Park, the Presidential Palace and the National Palace, which contains the National Museum, National Archives and National Library. The tomb of Carlos Fonseca is found in Central Park. Fonseca was a commander of the Sandanista or FSLN party which fought against the United States backed contras during the decades long war in Nicaragua. 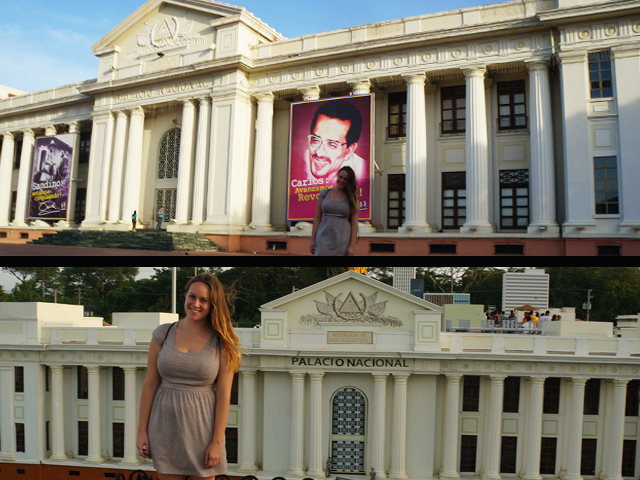 When the war ended in 1980, revolutionaries celebrated the victory in this plaza. Year after year on July 19 people from all over Nicaragua travel to the plaza to celebrate the victory of the war against the Somoza government. Despite its ties to protests and the revolution, the plaza is also known as a place of romance. 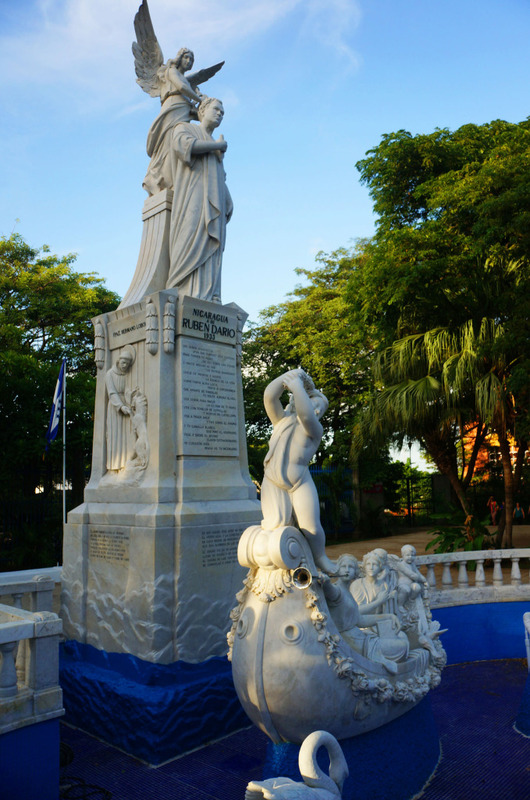 The plaza contains a statue of Rubén Darío, a Nicaraguan poet who created the modernism movement in Spanish-American literature. He is one of the most influential poets in Latin America and one of Nicaragua’s greatest national heroes. The nearby National Theater is named in his honor. Given its romantic nature, the plaza is a popular place for couples to go on dates during the weekend and for bride and grooms to be married. 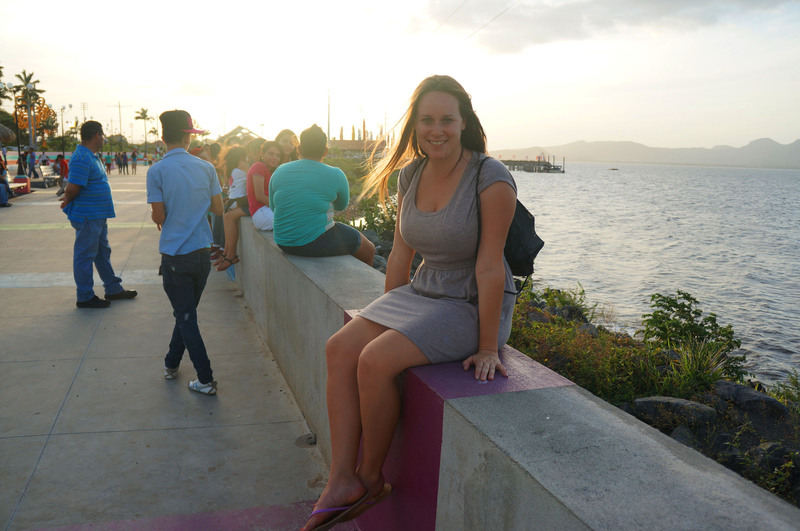 Managua sits on the shores of Lake Xolotlán, which just so happens to be the most contaminated lake in Central America. Paseo Xolotlán, a park for families, lines part of the lake. It has the usual sights found in a park… playgrounds, grassy knolls, benches with lake views, and… an airplane? Yes, there is an actual 747 airplane in the park, open for visitors to walk through. It’s an unexpected sight, weird to see until it became sad to see when I realized this is the only encounter most people here will ever have with an airplane. Unlike me and my spoiled life of travel, the majority of Nicaraguans will never board an airplane that flies. Roger told me the government added the airplane to the park so that all the people who don’t have the resources to fly can know what an airplane is like. Can you guess which National Palace is real and which is a model? Ok, so they aren’t actually crafted out of LEGOs, but Paseo Xolotlán does have a miniature version of Managua where families can walk in Godzilla-like proportion through the streets of Managua and past all the major landmarks including the Presidential Palace, National Palace and hotels. It reminded me of Miniland at LEGOLAND. 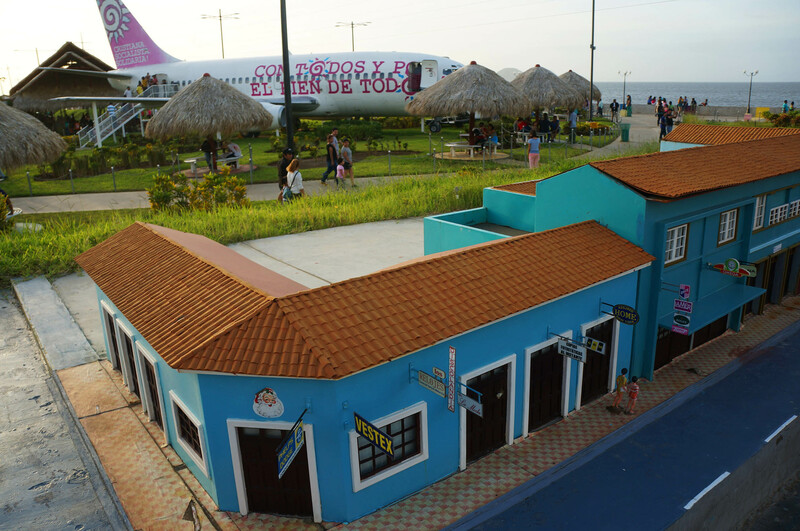 Well, at least Managua is the first Central American city that’s had anything that comes close to LEGOLAND! 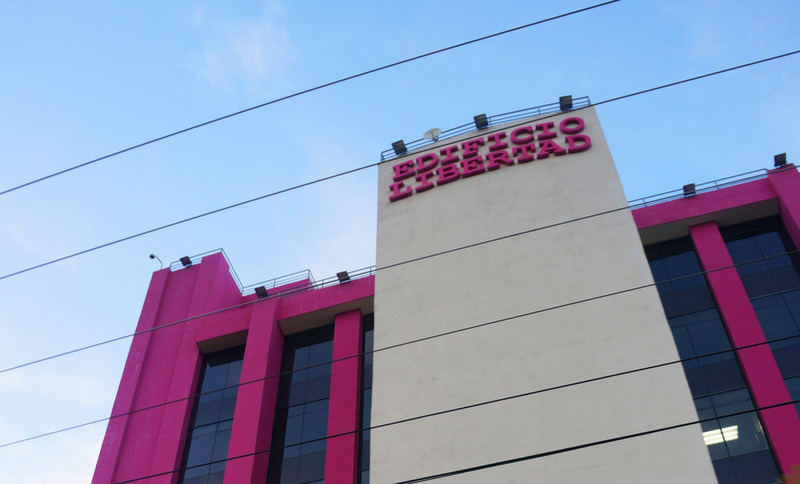 Nicaragua’s Social Security department is located in a building called Edificio Libertad, or Liberty Building. The government owns and operates this building and it is.. hot pink? I’ve never been to a country that has hot pink as an official color, but, apparently Nicaragua does. Roger told me that the official government colors are those that pertain to dawn, and this shade of pink is one of them. As Roger and I made our way back to his taxi we encountered a cultural performance taking place in an alcove near Central Park. Eager to watch I scooted closer to the stage, only to see that the performance was… dancing monsters? 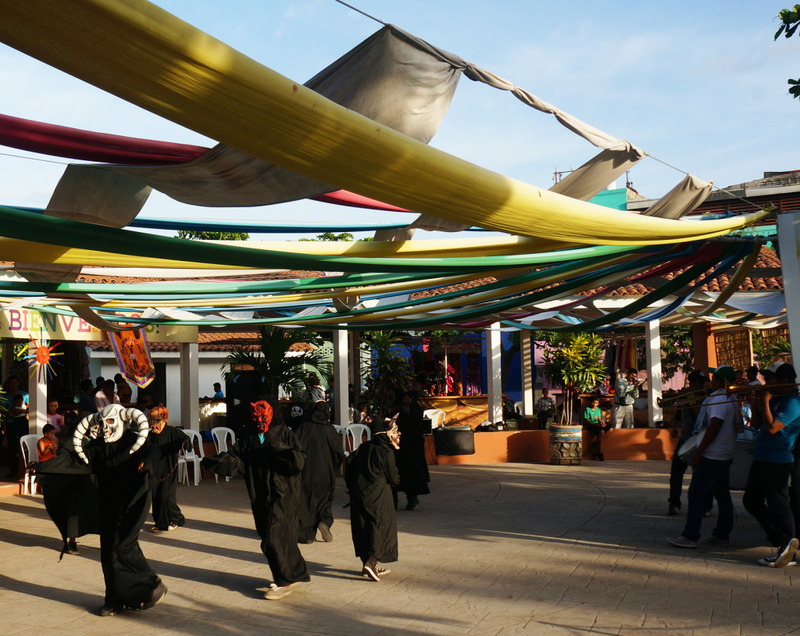 Dancing is a large part of Nicaraguan culture. The performance I had stumbled upon was Los Diablitos, or ‘Little Devils.’ This dance is typically performed by young boys wearing masks and tells stories from Nicaraguan folklore. HotelsCombined offers the best rates on hotels worldwide. Find and book your Managua accommodation below. Nice pictures, nice place to visit , thank you for this article, do you need to speak Spanish to go there ? Hi Majid! Speaking Spanish definitely helped me enjoy my time more in Nicaragua (and perhaps get around more efficiently), but you can definitely visit without speaking the language. Hello lauren your photos are informative and beautiful . These photos are unique and lovely. What a great adventure thanks for sharing. Hi! So nice you made it to Managua!! I would really really LOVE to go to Central America. Particularly to Nicaragua and Mexico, where some friends of mine live. BTW: my parents always prevent me from going there, even if I earn and save enough money to pay the trip myself. They argue I seem too “european” and that I may be kidnapped or killed or something. So I just want to ask you: did you feel unconfy at any time because of… I dont know: maybe lack of security? did you feel danger at any time? did you see something strange? Did someone try to rob or threat you? Do you know how it would feel in Mexico? Hey there thanks for your comment. Glad you liked my post about Managua. I haven’t actually traveled in Mexico for about ten years now so truthfully I can’t speak to the safety situation there. However, I did feel very comfortable in Nicaragua. I speak Spanish though which helps and stuck largely to the tourist path. These arent unusual sights at at, these are the most usual sights when visiting managua, maybe except for the dancing monsters. These photos are so cool! I lived in Managua 20 years ago, and none of this stuff was there then except for the cathedrals.